I have been doing research on the town of Ruff, Washington. My family’s farm was just northeast of this once thriving little town that is located in Grant County, Washington. My father’s birth certificate actually lists Ruff as his birthplace and I wanted to research what I could find about the community. Many of the early settlers including my grandparents were Bessarabia Germans as they came to America from Bessarabia, Russia which is known as Moldova today. My great grandparents on my father’s side came to American in 1891 when my grandfather was 5 years old. It was interesting to find that my grandmother was also from Bessarabia and came to America later and married my grandfather in Washington state. They eventually homesteaded near Ruff Washington and were dry land wheat farmers. I believe the town of Ruff was established around 1900 and had several businesses and at least one church the Ruff Evangelical Church. Here are a few photos that I found in my father’s old photo album. I remember going to the Ruff store as a young girl with my Dad in the early 60’s and bought a soda pop there. I am not sure that the original store building still exists. When you look at an aerial satellite map of the area I can’t see much in the once downtown area still standing anymore. The only images I was able to find on the Internet today is this you-tube video taken of Ruff in 2009 which shows the grain elevators and tanks and just a glimpse of the remaining buildings in the town. There are at least two rural cemeteries near Ruff. One is the Kappel Cemetery or East Ruff Cemetery and the Ruff Schultz Memorial Cemetery. Maggie Rail verified and transcribed both of these cemeteries. You can see her detailed records of the Kappel Cemetery and the Ruff Schultz Memorial Cemetery on the links on each I have attached. While this is just a little of the history of the Ruff Washington area, I hope if you found it useful that you let me know. Leave a comment or add any additional knowledge you may have of the area for me in your comments. Thank you! Do you have any more pictures of the town of Ruff? It isy understanding that there were four churches. I have a copy of a check written on the Ruff State Bank. It would be nice to know a little more about the town and businesses that existed there. I know get moved some of the buildings to Moses Lake when it was started. Don – I don’t personally have any other pictures of Ruff but have you checked with the Odessa Record? Also the Odessa Historical Society in Odessa, Washington is said to have more photos and information. I did find this Big Bend railroad site that does have some additional information about Ruff that you may find interesting. This article has details about some of the old businesses and history behind the area that I found useful. I also sent you an email if you’d like to correspond further. Dave – Wow such an old picture. I think the title is “Ebenezer Youth Association, Ruff, Wash” I sure wish my Dad was alive to see if he knew the names. Can you scan the photo? I’d love to see it. Thanks so much for reaching out to me about this. I will check for more pics for you. My great grandparents, and grandparents, uncles, aunts, etc are buried in the Kappel Cemetary. Farmed the area for a long time. Kathy – Thank you for the comment. I sent you an email and hope to share some family history and photos with you if possible. I lived there in the late 70’s my parent owned and ran the general store. We also owned the 2 lots acrossed from the store and I believe the water well. I know there there was a hotel there and the church was almost completely down. What great memories of this little town. 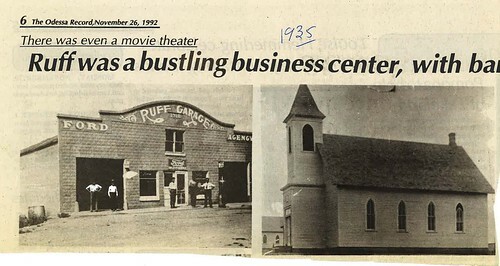 Hellen – So glad you shared your history of Ruff and your family’s store information with me. I remember going in the store in the early 60s for a pop with my Dad. I don’t think the store is there anymore but I have fond memories of it. My dad was born here and played baseball for the fabulous Ruff baseball team. He died when I was young and I was interested in the team. It seems it was special and well known in the area. His name was Albert (Skin) Schell. He was a pitcher for the team. Have you heard anything about this. @Phillip – I am not familiar with the Ruff baseball team but my Dad and other neighbor kids got together at our farm and played baseball. One of the Kagele’s was telling me that they rode horses up to our family’s farm to play baseball. I just learned about that recently. I wish my Dad was still alive so I could ask him more about the area baseball teams and games. Thanks so much for sharing your family’s history here. I have a picture of an Odessa baseball team. I am not from the area so would welcome any info. As I said below, my grandmother’s sister Maud Johnson Thiel taught school in the area I believe and this picture may have been associated with her family there in Washington. Any info is welcome regarding the ball team or the school. They are pretty cool pictures, and old. Nancy – I loved hearing about your family and the photo of the Odessa baseball team. 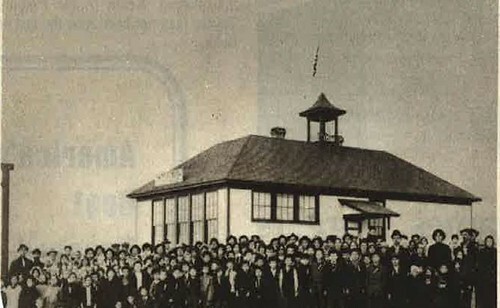 My Dad went to school in Odessa in his later years when there wasn’t at Ruff school any longer. I know baseball was an important sport in the area and neighboring kids got together at my grandparents farm for baseball games. I sent you a PM with more info and so happy we could connect and share our family’s history of the area. My family.. The Warrens were born and raised there check out our page on Facebook.. Growing up in Ruff..
Merrilyn – I sent you a private email but didn’t hear from you yet. I do remember several of the Warrens from Ruff. My Dad was long-time friends with many of the family. I hope you read this reply and respond again. I believe that my Grandmother’s sister Maud Johnson Thiel taught school in the area. I have a photo that was made in Ruff. I also have an old picture of an Odessa baseball team. Glad to have found your page! Are you familiar with a one room school in the area? 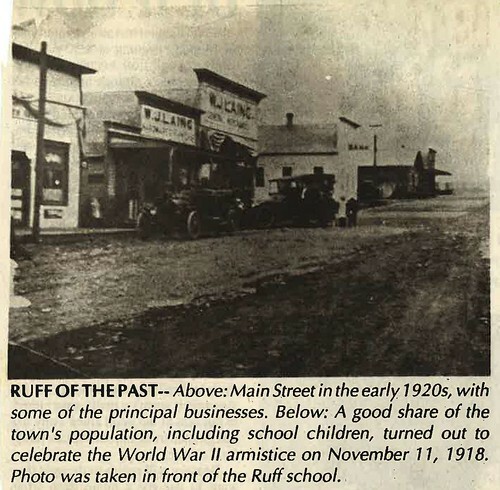 My great grandparents settled in Ruff. Also a wheat farm and were also Germans from Bessarabia Russia. The last name was Schwartz, I believe they settled in Ruff around 1880 or 1890. Tracie – I bet our great grandparents knew each other. I recognize the Schwartz name and will ask my mom if she remembers the family from the Ruff and Odessa area. My great grandpa and grandma came to America 1891 and bought the farm near Ruff in 1920. Hi Tracie! I’m looking for information on the family Gottschalk. They were German from Romania. Thanks! Great read. My family homestead was in Ruff. I have no pictures so if you could suggest where I could get a few pictures that would be great. @Dean- you might want to check with the Odessa Historical Museum for more info and photos. I know they have many old things from the area. Also the Odessa Record newspaper prints old pictures now and then. You might check out their archives for Ruff. I’m not sure what may be available on-line or you can call their offices. Best wishes and thanks for leaving a comment. Do you know when the grain elevator was built . My husband was one of the building persons by pouring the concrete for Colville Valley Concrete. Betty – I sent you an email with a few links to check out about the Ruff elevator. It looks like there was a wheat warehouse there starting in 1912. See these articles in this link. There appears to have been several additions to the warehouse over the years. What year did your husband work on the elevator? @Harvey and Lorene – I sent you an email with more info. Thank you so much for your comment. It is sad that there isn’t really anything left in Ruff anymore. I lived in Ruff from the time I was born until I was 19 I have a few pictures from Ruff. My maiden name is Schell. Thanks Gloria for the comment. I sent you an email and glad we could discuss further our common friends and people from Ruff. It is so sad to hear that the Ruff store is gone. I have such fond memories of going there with my dad and getting a bottle of pop in the summer.